The incidence of obesity has steadily climbed to epidemic proportions in the United States. To provide optimal surgical care for the growing number of obese surgical patients, surgeons and other healthcare personnel must often modify routine procedures and standard treatment protocols. Psychological support of obese patients is an additional factor that frequently must be addressed during the perioperative period. The incidence of obesity has steadily climbed to epidemic proportions in the United States (US). According to a 2010 report from the Centers for Disease Control, 26.7% of Americans currently meet the criteria for obesity (body mass index ≥30 kg/m2).1 To provide optimal surgical care for the growing number of obese surgical patients, surgeons and other healthcare personnel must overcome a variety of unique challenges. Routine procedures, daily patient care activities, and standard treatment protocols often must be modified to safely manage heavier patients. Psychological issues related to obesity are an additional factor that frequently must be addressed during the perioperative period. As the population of obese patients increases, hospitals will need to adapt to accommodate larger patients. Simply providing larger beds and transport devices for use with obese patients is not feasible. Bariatric specialty equipment with high weight capacity and mobility aids should be installed and used for the safety of both patients and healthcare workers. Patient care algorithms developed for bariatric surgery programs provide useful guidelines for the proper care of all obese patients in the acute care setting. The education of healthcare providers on the unique needs of obese patients is essential for injury reduction. On the admission of each patient, providers should assess and document their weight and activity level and should then use a team-assist approach when transferring patients with a limited ability to support their own weight. 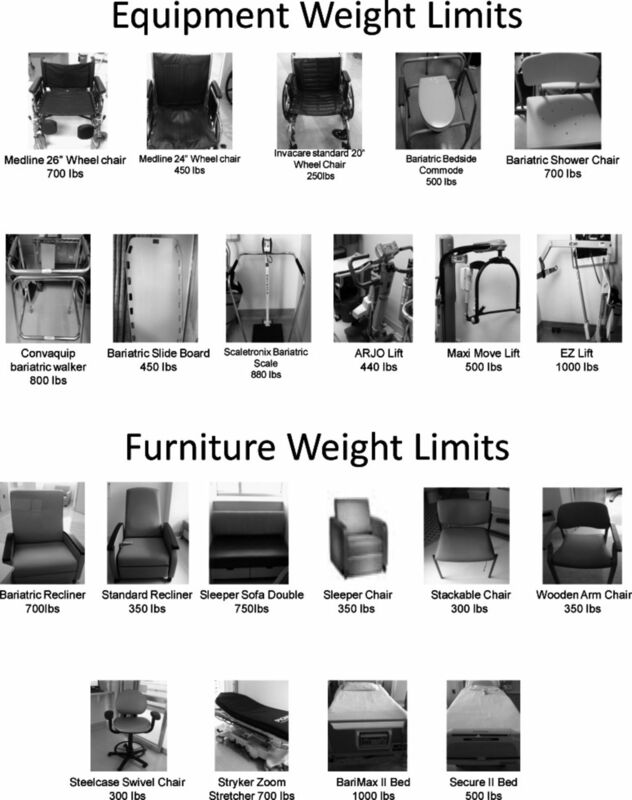 Hospital equipment—including beds, toilets, shower chairs, wheelchairs, and stretchers—should be labeled according to weight capacity, with a list of available equipment and location displayed for reference on the hospital ward (Figure).10-12 The table lists essential and recommended bariatric patient care equipment. Sample nursing ward reference placard. Structural changes to patient care facilities that may be necessary to accommodate increasingly larger patients include the expansion of doorways in patient rooms and bathroom facilities, the installation of floor-mounted or reinforced toilets, and the expansion of overall room dimensions. Common areas, such as clinic waiting rooms, also should provide oversized seating options to prevent injury and potential embarrassment for obese patients. An optimal postoperative recovery environment for obese patients should be free of obesity-related prejudice. Formal sensitivity training for hospital employees is a required component for bariatric surgical centers of excellence. As the number of obese patients increases, weight-bias education and policies should become mainstream. Based on data collected from 1970-2004, a study supported by the National Institutes of Health and the US Department of Agriculture projected further increases in the prevalence and cost of obesity in the United States.17 If current growth rates were sustained over time, nearly 100% of Americans would meet criteria for obesity by 2048. Annual obesity-related healthcare expenses are projected to double each decade, reaching nearly $1 trillion by 2030. As the number of obese patients continues to escalate, hospitals must adapt to accommodate the various needs of this patient population to provide them with safe, timely, and high-quality medical care. (8 6, 2010) Vital signs: state-specific obesity prevalence among adults—United States, 2009. MMWR Morb Mortal Wkly Rep 59(30):951–955, pmid:20689500. (8, 2006) Effect of obesity on image quality: fifteen-year longitudinal study for evaluation of dictated radiology reports. Radiology 240(2):435–439, pmid:16801372, Epub 2006 Jun 26. (Jan-Feb 2011) Radiol Technol 82(3):219–239, pmid:21209424, medical imaging challenges, Erratum in: Radiol Technol. 2011 Mar-Apr;82(4):320. (2, 2007) Impact of obesity on medical imaging and image-guided intervention. AJR Am J Roentgenol 188(2):433–440, pmid:17242253. (11, 2008) The challenge of CT and MRI imaging of obese individuals who present to the emergency department: a national survey. Obesity (Silver Spring) 16(11):2549–2551, pmid:18787528, Epub 2008 Sep 11. (Winter 2005) Practical issues in treating heavy patients on a LINAC treatment couch. J Appl Clin Med Phys 6(1):135–142, pmid:15770203, Epub 2005 Jan 12. (1996) Radiation Therapy Planning. 2nd ed (McGraw-Hill; New York, NY). (2008) in Technical Basis of Radiation Therapy: Practical Clinical Applications. 4th ed, Physics of treatment planning in radiation oncology, eds Levitt SH, Purdy JA, Perez CA, Vijayakumar S (Springer-Verlag; Heidelberg, Germany) In, eds, pp 69–106. (Winter 2002) A simple method of alignment for pelvic irradiation in obese patients. Med Dosim 27(4):269–270, pmid:12521072. (Spring 2007) Safe bariatric patient handling toolkit. Bariatr Nurs Surg Patient Care 2(1):17–46. (Nov-Dec 2005) Meeting bariatric patient care needs: procedures and protocol development. J Wound Ostomy Continence Nurs 32(6):402–406, pmid:16301907. (5, 2009) An update on best practice guidelines for specialized facilities and resources necessary for weight loss surgical programs. Obesity (Silver Spring) 17(5):911–917, pmid:19396071, Epub 2009 Feb 19. (4, 2006) Hospitals equip to meet the bariatric challenge. Rising number of obese patients necessitates specific supplies. Mater Manag Health Care 15(4):36–39. (2, 2004) Capital & candor. To meet the needs of obese patients, hospitals change processes, equipment and attitudes. Hosp Health Netw 78(2):58–62, pmid:14999879. (10, 2006) Confronting and coping with weight stigma: an investigation of overweight and obese adults. Obesity (Silver Spring) 14(10):1802–1815, pmid:17062811. (11, 2010) Reducing anti-fat prejudice in preservice health students: a randomized trial. Obesity (Silver Spring) 18(11):2138–2144, pmid:20395952, Epub 2010 Apr 15. (10, 2008) Will all Americans become overweight or obese? estimating the progression and cost of the US obesity epidemic. Obesity (Silver Spring) 16(10):2323–2330, pmid:18719634, Epub 2008 Jul 24.